Switching to clean energy is a great way to step up and do your part for your environment, and to inspire your friends and neighbors to do the same. We have the choice of whether or not we want to stem the tide of global climate change. This is a decision we all must make; we need to know if we really care about the future of our environment? Do we care about the state of the Earth, the state of the land, air, and water we leave to our children and grandchildren? Global climate change is no longer up for debate; we now know it is a real threat from which the planet is already suffering, one that we cannot ignore any longer. If we are really interested in preserving life as we know it for future generations, we must act now. 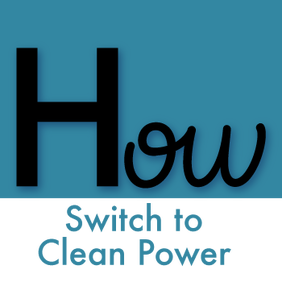 Switching to clean energy may only be one step, but it is one of the easiest and most effective things your household can do to create a safer, healthier, more prosperous environment. Be part of this new movement of forward-thinking citizens, who understand the importance of investing in a smarter future.